Leaking underground storage tanks (LUSTs) containing hazardous liquids, primarily petroleum products such as gasoline, diesel, kerosene, or oil have contaminated the groundwater and drinking water of thousands of communities across the United States. U.S. Environmental Protection Agency, U.S. Geological Survey. crack or disintegrate and leak. The average life expectancy of steel tanks installed in the 1950s and 1960s was thirty to fifty years. This statistic suggests that petroleum products have been leaking from these tanks, spread throughout the country, since the early 1980s. By 2001, the U.S. Environmental Protection Agency (EPA) was dealing with cleanups at 379,243 LUST sites in the United States. Corrosion usually causes tanks to leak slowly. Leaks from older tanks are often difficult to detect because inventory control is imprecise. Once released from a tank, gasoline sinks through unsaturated soil and, because gasoline is less dense than water, floats on the surface of the water table . Because most components of gasoline are fairly volatile —they readily become a vapor at a relatively low temperature—leaks often go undetected until the vapors are present at the ground's surface. In addition to the risk to water supplies, leaking gasoline also presents risk of fire and explosion when vapors from leaking tanks can travel through sewer lines and soils into buildings. Because nearly half of all Americans depend on groundwater for their drinking water, leaking underground storage tanks represent a significant public health threat. The most hazardous components of petroleum products are the BTEX compounds—benzene, toluene, ethylbenzene, and xylenes. Benzene is the most hazardous of these compounds due to the risk of cancer from drinking and bathing in water containing benzene. The maximum contaminant level set by the EPA is 5 parts per billion (ppb). Another potentially hazardous compound in gasoline is methyl tertiary butyl ether (MTBE). Ironically, MTBE is added to gasoline to combat air pollution by making the fuel burn cleaner. At concentrations as low as 20 ppb, MTBE makes drinking water unfit for human consumption. (This assessment is based on standards that correlate unfitness with the taste and odor left in the water by MTBE.) MTBE is currently classified as a potential human carcinogen , but there is no maximum contaminant level for MTBE in drinking water. As many as 9,000 community water wells in thirty-one states may be affected by MTBE contamination, and many states are phasing out its use in gasoline. Once LUSTs are identified and the extent of soil and groundwater contamination is determined, remediation can include removal of the leaking tanks, the contaminated soil, and the contaminants from the groundwater. Tank and contaminated soil removal is accomplished by excavation. Removal of groundwater contaminants is accomplished by the suction pumping of gasoline floating on the water table by air stripping, a process in which air is pumped through the water to cause the volatile compounds to evaporate, and by natural attenuation, the biodegradation of contaminants by microorganisms. Remediating contaminated groundwater can take decades, and some waters will never be made safe enough to drink. Dozens of communities have had to find alternative sources of drinking water because of gasoline contamination. The primary responsibility for the licensing, operation, and regulation of underground storage tanks (USTs) and the cleanup of LUSTs falls to the state. Most states fund remediation of LUST sites through licensing fees and surcharges on most petroleum products. The EPA oversees the state programs and augments their remediation efforts through grants to support LUST program staffing, and through direct assistance with emergency responses and cleanup. To prevent future problems, the EPA established UST standards in 1988 and gave tank owners ten years to upgrade or replace old tanks. New tanks must have corrosion protection and improved leak-detection systems. Nearly 1.5 million USTs and LUSTs have been closed. SEE ALSO P ETROLEUM ; S UPERFUND ; W ATER P OLLUTION . American Petroleum Institute. (1989). 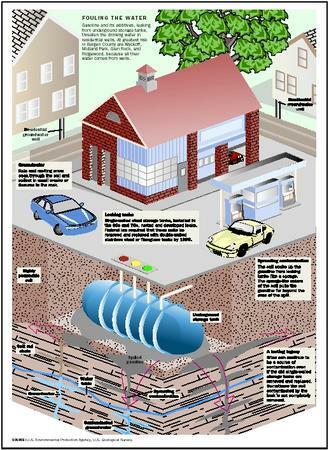 "Recommended Practices on Underground Petroleum Storage Tank Management." RP 1650. Washington, D.C.: Author. American Society for Testing and Materials. (1998). "Standard Guide for Performing Evaluations of Underground Storage Tank Systems for Operational Conformance with 40 CFR, Part 280 Regulations." Report ASTM E 1990-98. West Conshohocken, PA: ASTM. Office of Solid Waste and Emergency Response. (1998). "Technical Standards and Corrective Action Requirements for Owners and Operators of Underground Storage Tanks (Section 610 Review)." 63 FR 22709. Washington, D.C.: U.S. Environmental Protection Agency. Also available from http://www.epa.gov/swerust1 . Office of Solid Waste and Emergency Response. (2000). Catalog of EPA Materials on Underground Storage Tanks. EPA Report 510-B-00-001. Washington, D.C.: U.S. Environmental Protection Agency. Also available from http://www.epa.gov/swerust1 . In the remediation process of an abandoned gas station in my community, I was told that a concrete pad would have to remain in place over the tanks to prevent them from possibly rising to the ground surface. If this is possible, what exactly are the physics behind such an event? Note: The tanks are empty and there is the possibility is to leave the tanks in the ground. Could we request that tanks be filled with sand or gravel in order to have the concrete pad eliminated?